It's been quite a long January, and when they say this has been the worst flu season in several years, I totally believe it. The month started out with my son having a bad cold. Followed by my daughter catching the flu, my son a cold again and a lovely cold for myself. Then, the big whammy hit me last night. My throat hurt before I went to bed and consequently woke up with chills, stuffy nose, aches and a blazing headache at 5:00 am. So here I sit, wrapped in a fleece blanket with my Advil and tea in tow. It's truly been hard to get off the couch. My lovely children who are on semester break have helped walk the dog, prepare tea and feed me and themselves. Good friends have chipped in by driving them to their various activities. So what better time for comfort food? FN Dish's meal of the week is chili. 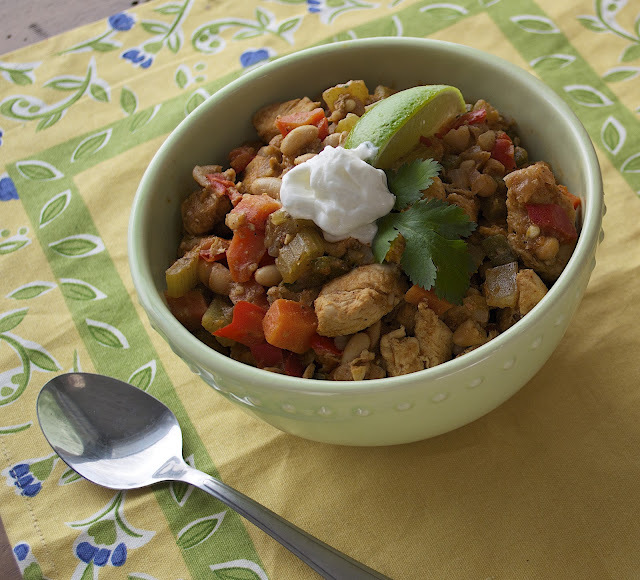 Not only is it comforting, but a hearty and simple dish for Super Bowl guests. Luckily I prepared and completed all my photos and editing yesterday - before the storm hit! 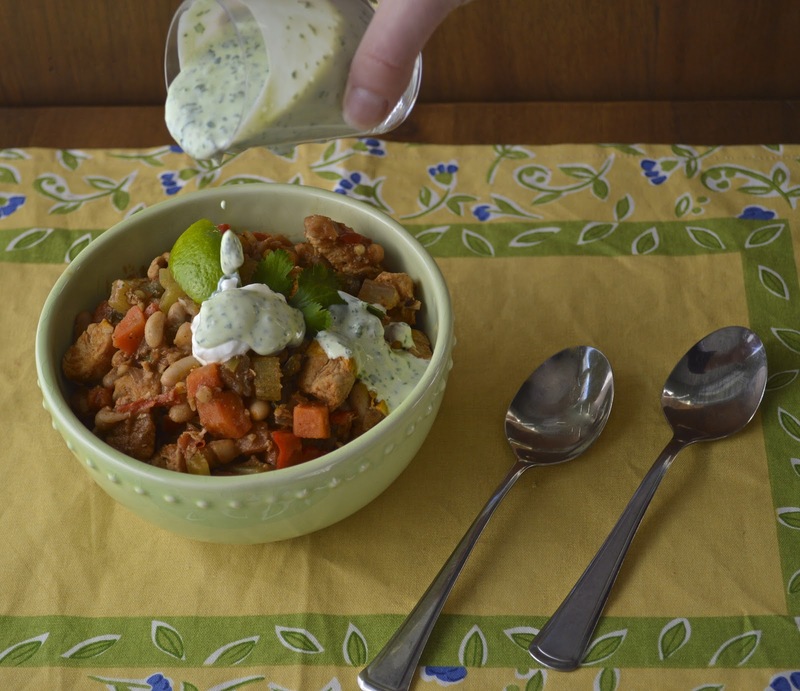 Enjoy this healthy chili with a big dollop of the tangy cilantro crema. Heat oil in a large dutch oven or heavy stock pot. Saute chicken and onions for 5 minutes until chicken is lightly browned. Add carrots, celery and peppers and saute for 3 minutes. Add chili powder, oregano and cumin. Stir to combine. Add beans, chicken stock and salt. Bring to a boil. Cover and cook on low heat for 30 - 40 minutes. While cooking put cilantro, sour cream and lime juice in a food processor. Blend until cilantro is completely chopped. Serve cilantro cream with chili. Mmmmmm the Cilantro Crema looks yummy, thinking of everything else it could be used with...Veggie dip maybe? Definitely. 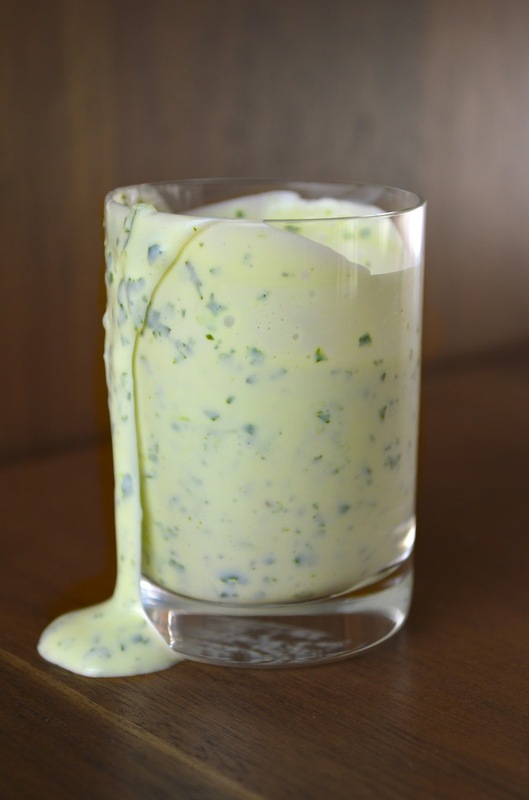 The cilantro crema is very versatile and i happen to be a cilantro fanatic! Join the conversation - I'd love to hear from you! Design by seven thirty three. Powered by Blogger.